PLCS Flowstop Bags are designed with the bladder held inside a thin yet strong synthetic fabric. This thin wall construction permits mains entry through a smaller tap hole than competitive brands. 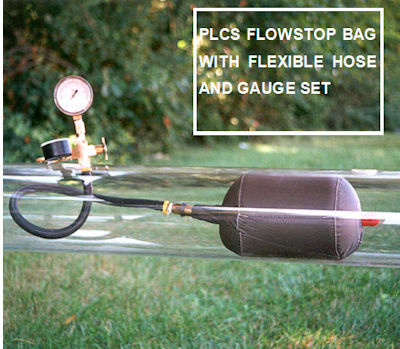 PLCS Flowstop Bags are barrel shaped to increase load on the pipe wall to retain position and increase the surface seal area to minimize gas bypass. Bags are clamped to a semi-rigid inflation core to control entry direction and prevent reversal in the main. Double end retention prevents bag loss during a sudden deflation. Standard sizes are available for all cast iron and steel mains from 2" - 48". Special sizes are available for PE plastic pipe. Bags are rated at 1¼ psi for mains up to 12". Available with rigid inflation control tee and rubber entry stopper, or with flexible hose. In an "open-hole" Double Block and Bleed shutdown, PLCS Flowstop Bags are recommended for use in pairs at each end of the shutdown. 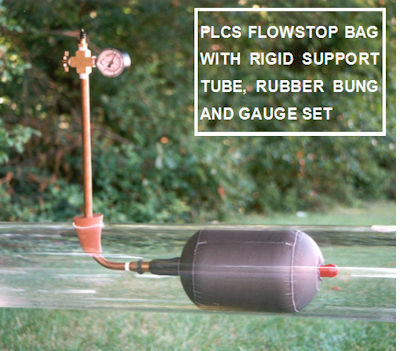 It is also possible to substitute one PLCS Flowstop Bag with a PLCS Sensor Bag (see separate literature) at each end and be able to continuously record the upstream and downstream pressure during the shutdown. PLCS Gas Bags can also be used in conjunction with ALH System-One tapping equipment to perform Control-Gas shutdowns.